2) бТЛЕОХ-1 (6,8 ЛН) Й бТЛЕОХ-2 (10 ЛН), мЙЧЙС,< 140 НМО. МЕФ. (Abate Begosew, Koeberl Christian, Kruger Johan F., Underwood James R.(Jr), 1999). 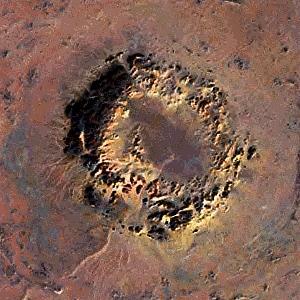 The Oasis impact crater is located in southeastern Libya, and has a diameter of 11.5km. The crater is extremely eroded, and appears as a set of concentric ridges of deformed rocks that rise above the local plain. The target rocks are Nubian sandstones of lower Cretaceous age that are commonly crushed and brecciated. Other rocks present in the area include quartz conglomerates and siltstones, also members of the Nubian formation. 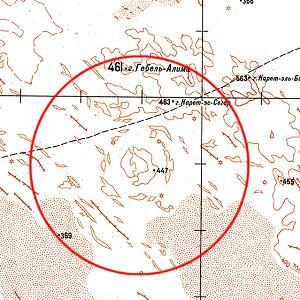 The most visible part of the crater is a central ring with a diameter of 5.1km. This central ring is made up of discontinuous hills as tall as 100m above the surface floor. The strata within this ring are intensely folded, and in some places strata are overturned or vertical. There is no observed central uplift structure, impact glass, breccia, or shatter cones associated with Oasis. 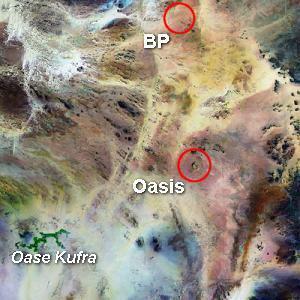 Oasis' proximity to the BP structure and its similar stage of erosion have led to speculation that the craters formed during a twin impact event. Shock metamorphism is abundant in the Nubian sandstones at Oasis. The most diagnostic features are open fractures and planar deformation features, which are quite abundant. Planar deformation fractures are present but poorly developed, which probably suggests low peak shock pressures. Shock lamellae are extremely well developed, with as many as nine distinct sets occurring in one quartz grain. These features are extremely similar, if not identical, to the shock metamorphic features found at the BP structure. Although there have not been any megabreccias found at Oasis, a team of scientists in the 1970s identified a glass-bearing microbreccia in the rocks at Oasis. This microbreccia consists of shock quartz grains and pieces of sandstone, intermixed with partially devitrified glass, all within a recrystallized matrix. The BP structure, and the Oasis structure, has been suggested as the source of the Libyan Desert Glass (Example ). The Libyan Desert Glass has been thought of as an impact glass, but there were no craters identified in the area at the time of this theory. The formation of BP and Oasis could account for the formation of an impact melt. 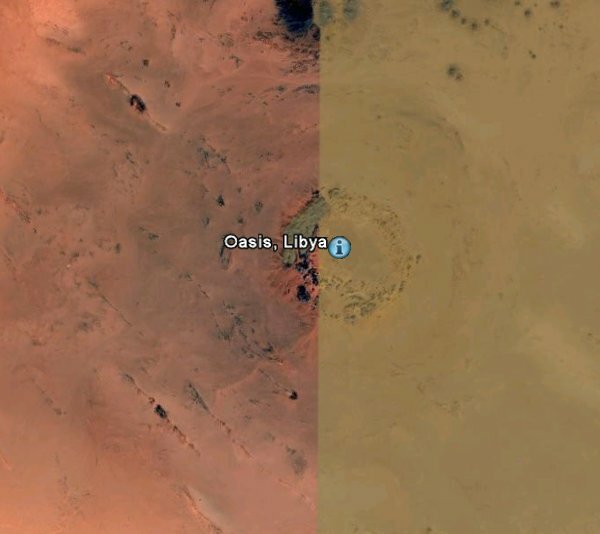 More recent studies have attempted to link these craters to the Libyan Desert Glass by geochemical analyses. 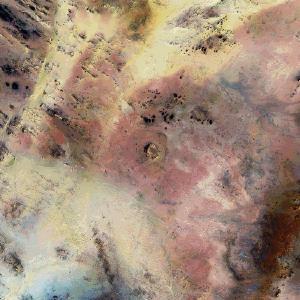 Compositional similarities between rocks from these craters and the Libyan Desert Glass have led to a tentative conclusion that the glass and the craters are connected. However, the uniformity of the local rocks makes it difficult to establish an undeniable link. The age of Oasis is difficult to constrain, since there is no impact melt. The age of the Nubian sandstone is late Cretaceous, so the time of the impact event can be limited to between now and ~100 million years ago.